This recipe just takes me back to childhood. I remember seeing my grandmother make gnocchi for the first time. This recipe is egg free so anyone that has an allergy to eggs worry no more. Making gnocchi can be a fun family cooking experience. I love to get my kids involved. After making this gnocchi you can pretty much make any sauce you would like, you can even do a brown butter and sage sauce. I hope you enjoy! 4 Idaho or russet potatoes, peeled and shredded. Take a fork and pike potatoes all around. Wash and place potatoes in the microwave for about 14 to 15 minutes. I don’t use the microwave a lot but I feel for this recipe it helps the potatoes not retain so much water. If you don’t have a potato ricer feel free to use a grater to grate the potatoes. Make a well in the middle of the flour, add the grated potatoes and salt. Begin by folding everything together. Knead for 4 to 5 minutes until well incorporated and smooth. Cut the dough into 4 pieces. Roll out each piece into a rope with desired thickness. Cut into small pieces about 3/4 inch. Next take a fork and roll the pieces on there to get little ridges. Take a baking sheet with a clean dish towel and dust some flour on it. Lay the pieces of gnocchi on top. Place gnocchi to the side while you bring a pot of water to a boil. Make sure to season your boiling water (salty like the sea). Add gnocchi to the water and be careful not to over crowd the pot. When gnocchi floats to the top it’s pretty much ready. 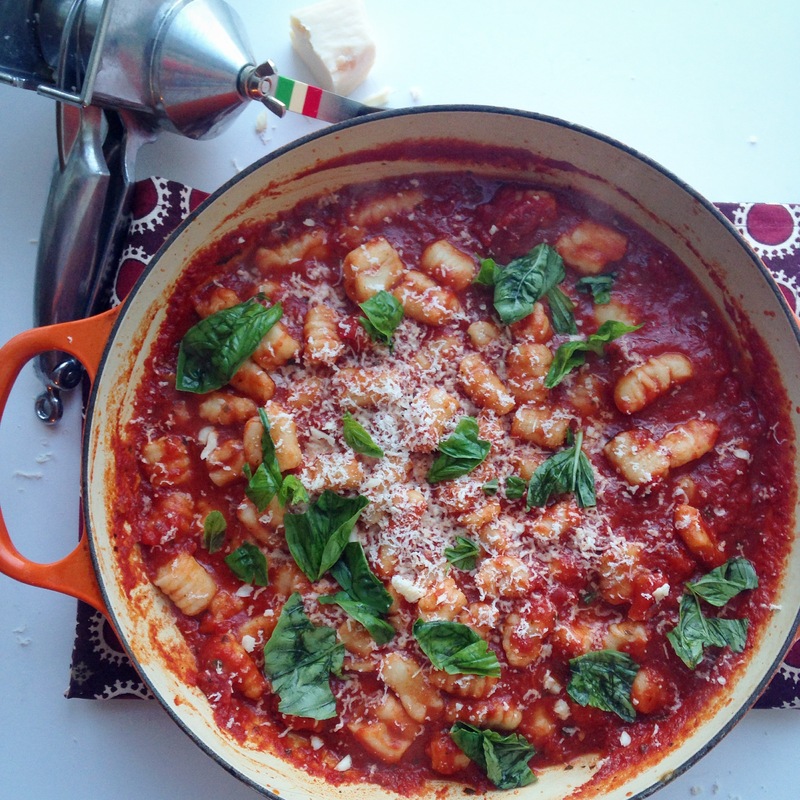 Toss the gnocchi with favorite sauce, cheese, basil and enjoy. One of these days I am going to make gnocchi. This recipe sounds perfect!